M.C. Escher (1898-1972) was one of the most remarkable graphic artists of all time. Much of his work was based on mathematical principles of illusion and symmetry. 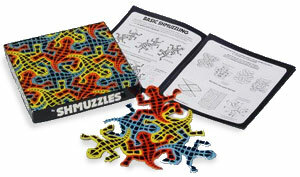 His famous tessellation drawings served as the inspiration for the Shmuzzle Puzzle. In the 1976 while teaching Management Science at the University of Chicago it occurred to me to cut some of Escher's tessellation figures out of wood. I hoped they could be re-assembled many different ways. But to my disappointment they did not fit well, because they were drawn free-hand. Ultimately I discovered a formula, which in theory would make for a perfect fit. Inspired by Escher's "Reptiles", I created a salamander design according to the formula, and made a dozen out of wood on a bandsaw. When I first put the pieces together I had a new sensation that I couldn't put into words. It was strangely gratifying and mesmerizing. Friends who saw the pieces would say: "Oh a puzzle!" Then they would start putting them together and have the same mesmerizing sensation. About the fifth time someone called it a puzzle I spontaneously blurted out: "No, it's a SHMUZZLE," and the name stuck. I then produced a few thousand sets out of cardboard. But even with a mathematically precise formula it was still impossible to get a perfect fit from the die cutting equipment at the time. In 1979 I discovered a technology for making cutting dies with a digitized laser. This provided the accuracy to cut the pieces pre-assembled, with a picture on the back. Another big break came when a friend at the University of Chicago introduced me to Bud Lifton, who headed up a large printing plant in Chicago. With Bud's enthusiastic support and experience in the printing industry the SHMUZZLE Puzzle was born. It was very popular in the early 1980's. However, the extreme accuracy required made it expensive to produce. In spite of continued demand, it became financially infeasible to continue, and production stopped in 1983. In 2002, Jerry Smith of Toronto was rummaging through his basement when something hit him on the head. At first he thought the sky was falling. But on closer inspection it was a 20 year old Shmuzzle Puzzle left over from when he distributed the product in Canada and Australia. In the intervening years he had founded the Canadian Group, a firm that produces and markets millions of jigsaw puzzles world-wide. Jerry looked at the Shmuzzle puzzle and then looked in the mirror. "I make puzzles" he said to himself, "I could make SHMUZZLE Puzzles!" Jerry tracked me down at Stanford and proposed that we re-introduce it. He was sure that with today's technology and his production volume it would be much less expensive to manufacture. By 2003 the puzzles were in production. So just when you thought it was safe to return to the puzzle department, they're back! 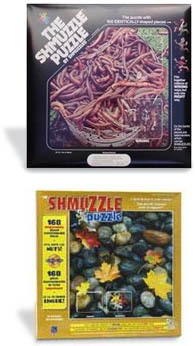 The Canadian Group has done a fabulous job of manufacturing both the regular and children's version of the SHMUZZLE Puzzle. Over a quarter of a century after I first experienced Shmuzzling I still don't have words for this strangely gratifying and mesmerizing sensation. But in the information age, words are no longer needed. Simply click here to try Cyber Shmuzzling for yourself. Take it from me, it's almost as good as the real thing! Click here to visit Sam's Home Page. In the 1980's many teachers used SHMUZZLES in class to teach the geometrical concepts of symmetry and tessellation. These subjects have grown even more popular over time. Below are some wonderful web sites devoted to educational activities in these areas. Suzanne Alejandre has developed an excellent set of lesson plans, software resources, actual student tessellation designs and much more. Don't miss it. Jill Britton has created a wonderful site with 30 activity links to everything from the symmetry of butterflies to Virtual on screen Manipulatives. You could get lost here for hours. 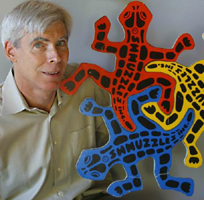 Bruce Bilney's commercial site for entertaining educational materials contains an Animated Tessellation of (what else) a Kangaroo. Bruce calls this a TESSELLANIMATION, and it is definitely worth the trip to the Southern Hemisphere of Cyberspace. Makoto Nakamura is a Japanese artist whose magnificent animated and 3D tessellations are as varied and beautiful as Escher's. Anyone interested in tessellation must visit this site.